The Bulova B1659 Usonian II Mantel Clock is part of the Frank Lloyd Wright Collection. It is based on the 'Board and Batten' walls seen in the Usonian® homes, 1936-1959. 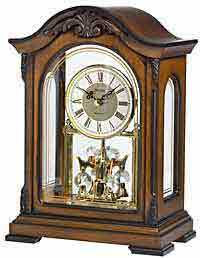 This mantle clock has a solid alder case with a natural finish. 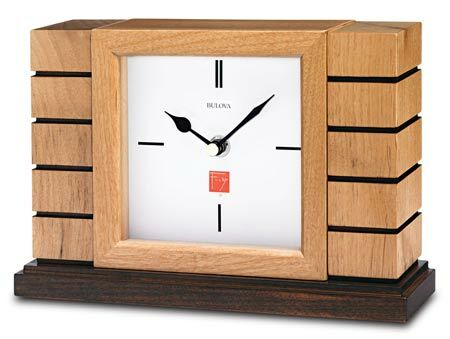 The walnut stained base and accent lines help accentuate this contemporary clock. The protective glass lens covers the square white face. Black single line markeres for the 3, 6, and 9 and a double line marker at the 12 position. The accurate quartz movement requires 1 AA battery. Size : Height: 6.5" Width: 9.5" Depth: 2.75"
Clocks for sale at The Clock Depot including the B1659 at discount prices.